Finally, Hi5 mouse hunter can enjoy the fun together with Facebook mouse hunter! 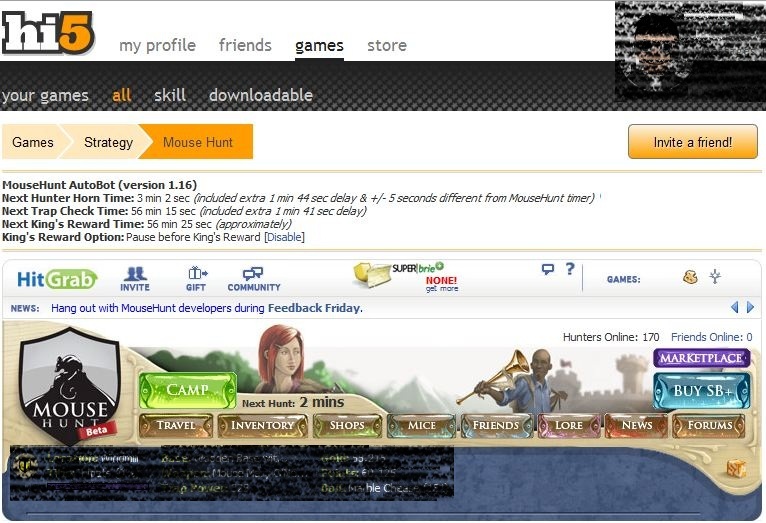 Now the script support both Facebook and Hi5 MouseHunt game application. Yes, one script support both platform. What are you waiting for, start the script and do the work! The script is still relative new for Hi5, please expect some bug to run into your trap! Facebook mouse hunters are advised to use version 1.15. MouseHunt AutoBot is an advance user script to automate sounding the hunter horn in MouseHunt application in Facebook and Hi5 with MouseHunt version 3.0 (Longtail) supported and many other features. In a simple word, bot for MouseHunt. Time of next hunter horn and trap check will show on the webpage title. The time of the next hunter horn will automatically detected without refreshing the page again. Users can customize the script according to their need by themselves such as add extra random time delay before sounding the hunter horn (Please look for == Basic User Preference Setting (Begin) == in the script). Users can choose to bot safety with many safety check features which act like a human, or bot aggressively. Part of the script is actually base on Facebook MouseHunt Game Auto Horn Blower. The script for Hi5 is still relative new. Please expect some catch some bug on your trap! Facebook mouse hunters are encouraged to use version 1.15 instead. Hey there, thanks for creating these awesome mousehunt scripts for us players! Though I don’t have the knowledge to customize your script, I must say that the default functions are awesome! If you have the spare time, could you teach me how to customize your awesome mousehunt script? Thanks bro.